Do you know your tropical trees? Can you identify this one? This picture of the tree's leaves and blossoms was taken in Thailand. The fragrance of these blossoms is very startling and unique. This plant is not Cestrum nocturnum. This is Alstonia scholaris or Devils tree. Looks like it might be Cestrum Nocturnum. Cestrum nocturnum is a species of Cestrum in the plant family Solanaceae (the potato family). The species is native to the West Indies and South asia. Common names include Raatraani (Marathi: रातराणी), night-blooming cestrum, Hasna Hena, lady of the night, queen of the night, night-blooming jessamine and night-blooming jasmine. While I am not familiar with either plants, I agree with Anup wthis is not Night Jessamine (C. nosturnum). His/her guess of Devil Tree (Alstonia scholaris) seems a lot more likely to me. Cestrum is a shrubby species that rarely gets to more than four meters (~12 ft) and lacks a defined trunk. This is very clearly a tree. Cestrum has prominent acuminate leaf tips, those of Alstonia, like those in estephan500's picture, are obtuse (blunt). Leaf nervation is also very different from that I see in images of C. nocturnum, which curves markedly, whereas it is almost perpendicular to the leaf shape in Alstonia and this mystery plant. 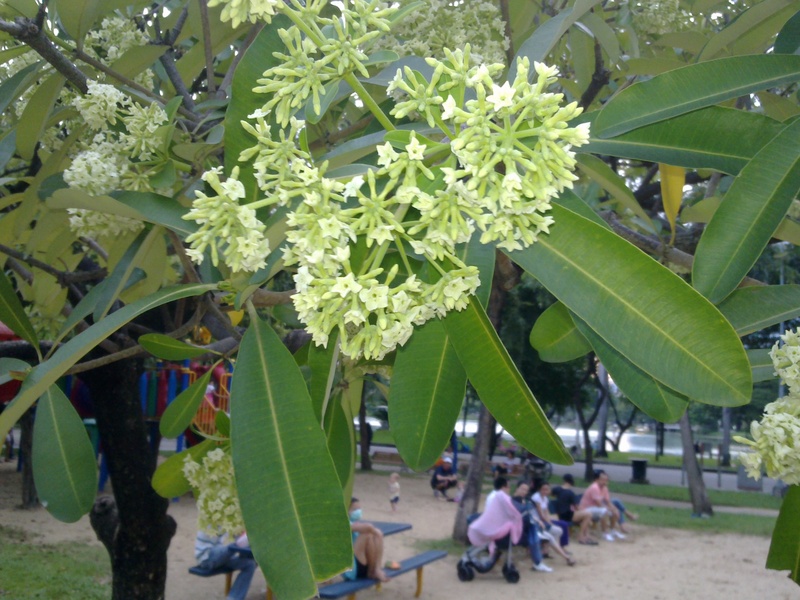 Alstonia scholaris is a native of Southeast Asia. Cestrum nocturnum is a Caribbean (West Indies) species. What is this tree from Thailand with medicinal properties? Please help me to identify this plant, please!